If you are looking for more information on the 2017 Kia Sportage, we got you covered. We have many 2017 Kia sportages for sale in Harriosnburg VA, Staunton VA, Waynesboro VA, and Charlottesville VA. We will help you get in a new Kia Sportage today! The 2016 Kia Sportage won many JD Power awards and earned the title of “highest ranked small SUV in Initial Quality” by JD Power. Here is the special report from JD Power that explains why the Kia Sportage is the best small SUV on the market. The success of Kia’s fanciest trim levels is proof that the brand’s push upmarket is working. Impressively spec’d, range-topping SX and SXL models are now offered on most Kias, and each comes with all the fixings and a heavy dose of style. The redesigned 2017 Sportage crossover is no exception, and its SX Turbo trim offers all that along with a measure of accelerative verve courtesy of its punchy 2.0-liter turbocharged engine. The Kia Sportage is a mid-level EX model, powered by a naturally aspirated 2.4-liter inline-four. LX and EX models, both of which come standard with this engine, make up a majority of Kia Sportage sales and face off more directly against the Honda CR-V and the Toyota RAV4, among many others. The Sportage is all new for 2017, but the base powertrain tested here is mostly carried over from the 2016 Kia Sportage model. Some tuning differences result in slightly better fuel economy, but the engine’s 181 horsepower and 175 lb-ft of torque are within a hair of the previous version’s 180 horsepower and 176 lb-ft.
Unsurprisingly, this Sportage is significantly slower than its turbocharged sibling, which has 59 more horsepower and an additional 85 lb-ft of torque. The EX’s zero-to-60-mph time is 1.9 seconds behind that of the SX Turbo, at 8.6 seconds, its quarter-mile lags by 1.7 seconds, and its top-speed governor kicks in 21 mph earlier, at 114 mph. Admittedly, that turbocharged Sportage we tested sent torque to the front wheels only, while this EX model was equipped with all-wheel drive. Still, many of the Kia Sportage’s all-wheel-drive competitors are quicker, too, with the Honda CR-V, the Toyota RAV4, the Mazda CX-5, and the 1.6-liter turbocharged Hyundai Tucson (which is otherwise mechanically related to the Sportage) all beating the Kia in the sprint to 60 mph. 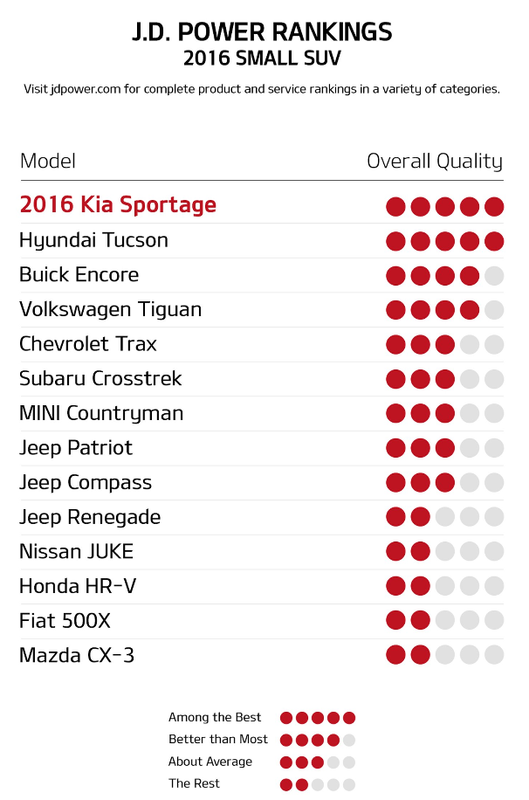 That’s disappointing when you consider that the Sportage gets only 25 mpg in the EPA’s highway cycle, while the CR-V, CX-5, and 1.6T Tucson score 30 or 31 mpg in the same test. The Kia’s 2.4-liter four-cylinder isn’t the most refined piece, either, with a relatively gritty texture and some buzziness in the upper rev ranges. We much prefer the 1.6-liter turbocharged four that can be found in the Tucson, which delivers smooth and tractable power with strong midrange punch (the naturally aspirated 2.4 is not available in the Hyundai). But while we noticed some lurching and odd behavior from the Tucson’s dual-clutch automatic transmission, we didn’t find much to fault with the Sportage’s conventional six-speed automatic, which shifts smoothly and is rarely caught off-guard by sudden requests from your right foot. While the Sportage EX doesn’t have the firmer suspension of the SX Turbo, it still resides on the sportier side of its class. Body motions are well controlled and the steering is accurate, giving the Kia fairly deft responses. The ride is firm but not stiff, providing plenty of comfort without any sensation of floatiness. At the test track, the Sportage EX circled the skidpad at 0.83 g—better than our most recent tests of the AWD CR-V and CX-5 models—and stopped from 70 mph in a competitive 173 feet. The EX also doesn’t give up much to the SX Turbo in the style department. All 2017 Sportages feature a stubby nose that might be a turn-off to some, but we think it’s easier to digest when shorn of the uplevel SX variant’s complex fog lights, extra chrome trim, and faux skid plate. The EX presents a cleaner face to the world, which meshes better with the rest of the crossover’s sleek shape. On the inside, too, the EX is hardly a downgrade. The cabin is a pleasant place to spend time, particularly with the standard leather seats and an easy-to-use, attractive dashboard layout. Materials look and feel upscale, and the audio and climate controls are logically arranged on the center stack. The rear seat is spacious and airy, although cargo volume, at 31 cubic feet, is on the low side for this class. Both the CR-V and the RAV4 offer more room in the back, and, by our estimation, the Sportage’s lift-over height should be lower to ease loading of larger or heavier items. 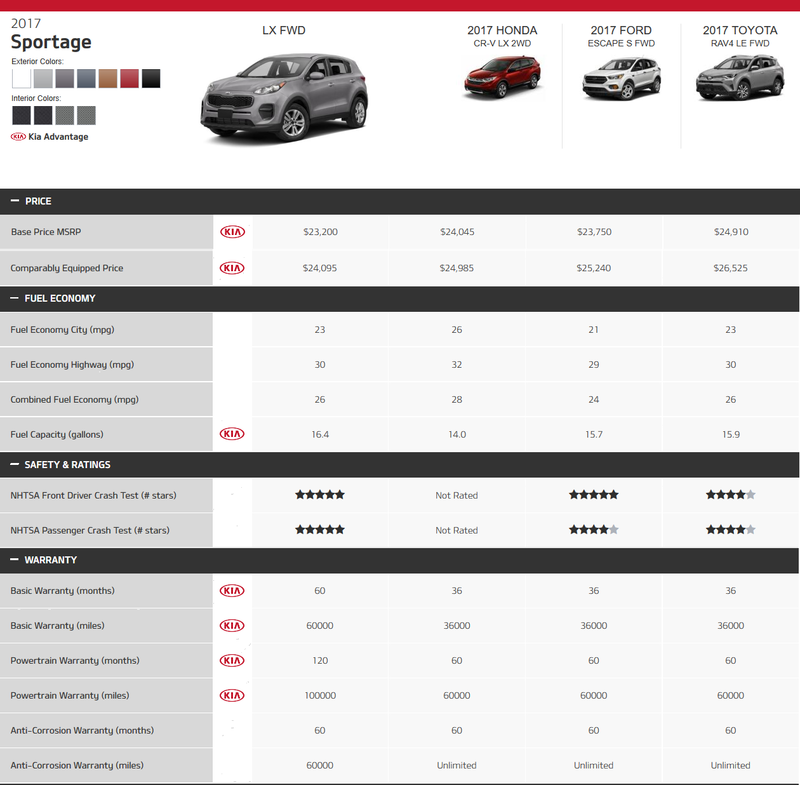 Take a test drive of a Kia Sportage SUV and experience all the great options and features that are available. There is a $1900 Premium package adding a panoramic sunroof, blind-spot detection, and a heated steering wheel, and the $2800 Technology package bringing goodies such as a Harman/Kardon sound system, navigation, a power liftgate, lane-departure warning, and automated emergency braking. 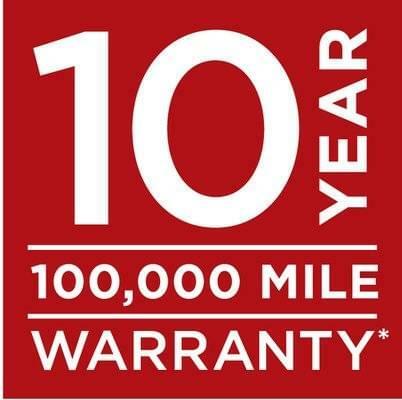 Come down to Steven Kia today and expereince it for yourself! Even with all that equipment, the 2017 Kia Sportage with all those options still rang in at just $32,595, a value for such a well-equipped crossover. You’ll pay more for a similarly optioned Honda CR-V Touring AWD ($34,295) or a Toyota RAV4 Limited AWD ($35,245). For that kind of money, we might choose the $34,895 Sportage SX Turbo AWD with its much more potent powerplant. Here at Steven Kia we many money saving lease deals on Kia Sportages. Give us a call at (888) 375-1642 or stop by for a test drive of a 2017 Kia Sportage. But as enticing as the slick and quick Sportage SX Turbo is, there’s still plenty of goodness to be found in the lower reaches of the Kia Sportage lineup in Harrisonburg Virginia. You’ll sacrifice power—and with little return in terms of fuel economy—but the nicely trimmed interior and competent dynamics remain. In other words, the fanciest Kias aren’t the only ones that deserve attention. Our vehicles sell fast! Submit below and we'll let you know if its available to show. We'll have it ready for your test drive!